Finally, BSE Sensex closed at 26,492 down 324 points, while NSE Nifty closed at 7,933 down 109 points over the previous close. This week is turning out to be a terrible one for the stock market in India. The indices cracked sharply on Tuesday with the Sensex and Nifty closing at their lowest level in September. Besides the weak global cues, sentiment was hit after India's export growth decreased to 2.35% at US$26.95bn in August, thereby, increasing trade deficit to US$10.83bn. On the other hand, imports slipped by 2.69% to US$190.94bn during April-August period. Trade deficit during the same period was US$56.15bn, down from US$70.6bn during the corresponding period last year. Not a single sectoral index on the BSE managed to close with gains. The Realty index was the top loser followed by BSE Power, Metals, Oil & Gas and the Banking indices. Apart from the index heavyweights, even the broader indices saw blood bath as the BSE Mid-Cap and the Small-Cap index both lost over 3.5% each. Tata Power, BPCL, Lupin, Tata Steel, PNB, Jindal Steel, DLF, ONGC and NTPC were among the losers in Nifty. TCS, HCL Tech, Dr Reddy, Bharti Airtel, Sun Pharma, ITC, Infosys, HUL, M&M, Hero Motocorp, Indus Ind Bank were among gainers in Nifty. 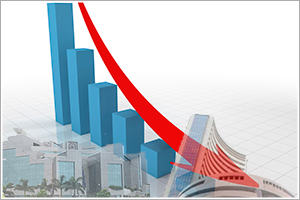 On the BSE, 2221 stocks declined against 808 advancing stocks, while 89 remained unchanged. Mastek which is set to demerge its insurance business into a new company Majesco, is trading up 6.5% on BSE today. Shares of Venus Remedies slumped 17.58% to close at Rs. 312 after ratings agency Crisil downgraded the company's the bank facilities to D from BB+. Shares of Piramal Enterprises surged 7% at Rs790 on reports that German firm DiaSys Diagnostic Systems GmbH has agreed to buy diagnostic solutions business from Ajay Piramal-led Piramal Enterprises Ltd for an undisclosed amount. Shares of Yes Bank declined 2.9% in trade on Tuesday after MSCI excluded the bank from its standard and mid-cap indexes. Shares of ONGC was down 3% to Rs 409, after the government cleared 5% disinvestment in oil major. Shares of Cox and Kings surged 7% to Rs 336,on reports that company is planning to raise about Rs 300-350 crore via qualified institutional placements (QIP). The SBI decided to revise its retail term deposit interest rates for deposits below Rs. 1 crore from 18 September 2014. SBI was up 0.1% at Rs. 2,627 on BSE. Lupin entered into a strategic partnership with Merck Serono, the Biopharmaceutical division of Merck. Lupin closed 2.81% lower at Rs. 1,375 on BSE.